As I get read to leave the US and head back to NZ, I am am filled with so many emotions. Humbled at how incredibly powerful the whole trip was and how much love was shared with me. So very grateful that I had this amazing opportunity. Sad to say good-bye to family and friends here in the US. But so very happy and excited to see my sons and my friends back in NZ. So many emotions all at once. I decided to make a video about this, rather than write about it this time. Feeling inspired! I’d love to hear how you handle it as one door closes, often waiting for the next one to open. And as always thanks for stopping by, I appreciate it. So very wonderful to be featured on She Writes Press Behind the Book! If you don’t know about the website She Writes – go explore it now, it great! What is She Writes? She Writes is the largest community of women writers online. She Writes is your place to find community, and all of our place to foster it. Whether you’re well published, just starting out, a novelist, journalist, blogger, memoirist, screenwriter, poet, playwright, agent, editor, or publicist, She Writes is Your Community. I had a dream of writing a book for many years; of getting published, of talking about things that I hold so sacred in my heart; but the fear of failure was rampant, the self-doubt debilitating. It took years just to start the process, then it took ten years to write, ten years! I thought that was exceptional. Then I read about all the other writers who took just as long and longer. I began writing the book that I had been thinking about and talking about for so long because my son Lukas, at age 12, challenged me to. I felt backed into a corner, I knew I had to put my money where my mouth was or I would feel like everything I had been saying to my sons – “You can do it!” “Follow your dreams!” – would be empty, a lie. So I started writing. I started writing and deleting; and feeling not good enough to write a book and feeling like a fraud. I’m kind of a quote junkie, often looking for inspiration from quotes when I’m mired in self-doubt. So when I was in that place of doubt and fear, I looked for inspiration. There were plenty of times when I was in the dark and all I had left of my dream of publication was stubborn hope. It was not an easy journey. When I finally finished my first draft about 5 years later, I started looking for an agent. Oh my God – talk about sitting in the dark with nothing but hope! I had months and months of rejection letters, too many to count, the darkness got darker, the hope fainter. Then finally, I found an agent in London, I signed a contract and I was over the moon. Now, I thought, now finally the hard work is over, I have someone else to do my work and get my book out there. It took over a year, lots of frustration and more darkness, but finally my agent was able to land a publication deal with a small publisher in London. I was thrilled. I celebrated and believed the time had come. About a year later, after jumping through hoops, working with an editor and inching closer, my agent decided he didn’t want to be an agent anymore, that the publishing landscape had changed too much and was not working for him anymore; so I lost my agent and the publishing contract went with him. I was back to square one, and I decided that I just couldn’t do it anymore. Then about two weeks later, while meditating, I heard a small, still voice in my head, the voice said ‘don’t give up.’ I grimaced. What an unimaginative inner voice! I thought of Richard Bach’s quote – “A professional writer is an amateur who didn’t quit.” So I revamped and reworked and wrote some more. Then I contacted an old friend. Her name popped into my head, and I thought it unusual. I wasn’t that close to her, and had not been in contact with her for years. But we were friends on Facebook, and I have learned to trust things that pop into my head, sometimes not very imaginative, but usually very helpful. So I messaged her and she messaged back the next day. She’s the one who told me about She Writes Press. I had never heard of them, but when I read about them, my pulse quickened. They sounded perfect. I contacted Brooke Warner and we scheduled a Skype. She said my book sounded like a good fit for SWP. I signed a contract and I started working with the amazing team at She Writes. I still had a steep climb ahead of me, but luckily the climb was accompanied by some truly magnificent women: Brooke Warner, a power house and visionary; Annie Tucker, editor extraordinaire; and a host of truly talented authors, all so supportive. The fellowship of authors at SWP is fantastic; they are generous of spirit, freely give advice and tips, and always cheer each other on. I am grateful beyond measure that I ended up in such an incredible publishing house. And now I am on a book tour with my very own book. 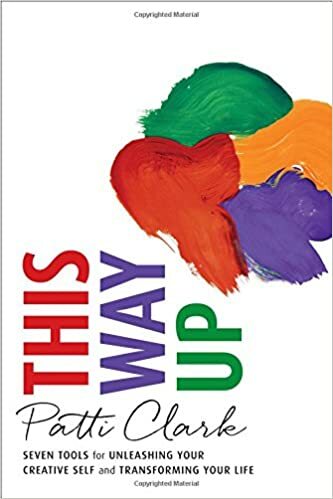 This Way Up was truly a labor of love, and an extreme act of faith. I believed that if I just kept showing up and kept moving in the direction of my dream that the dawn would come. And it did. So I am here to tell all of you – Don’t give up! Keep moving in the direction of your dream. It is so worth the journey. Check out She Writes – it’s a great community of women writers supporting each other. If you are a writer or aspiring to be one, join us there! Thank you Darrell for featuring This Way Up in Snowflakes in a Blizzard! THE BOOK: This Way Up: Seven Tools for Unleashing Your Creative Self and Transforming Your Life.